Users are lucky today when they want to edit their videos on Mac as the internet has been awash with various video editors. However, the toughest part is to choose the right video editing software, especially when it comes to Apple iMovie vs Final Cut Pro, as both programs are video editors produced by Apple. As a matter of fact, iMoive and Final Cut Pro cater to different user bases: iMovie is very popular among Mac users who want to share and create their own videos while others are well-served by Final Cut Pro at the high end. To choose the suitable tool, you'd better consider which features you'll need before you make a purchase. 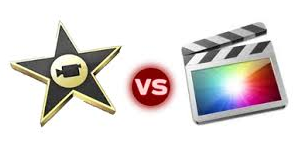 Keep reading and pay attention to the difference between iMovie and Final Cut Pro below. iMovie is an Apple video editing software which only runs on the Macintosh operating system. As the basic video editing solution from Apple, it is quite novice-friendly and allows users to create movies from a number of different sources including digital video cameras, DV-encoded files, and images and do various simple tasks to the videos like add video titles, perform simple transitions etc. 1. User friendly and easy to use and learn. Even if you are a newbie, you can start editing videos with iMovie right away, however time would be taken if you want to get the hang of it. You are allowed to add some effects and background music, combine several photos at once, and organize your videos to experience great function of this video editing software. 2. Friendly interface. The organized function layout and design on its friendly interface give you great convenience when you are editing your videos. 3. Convenient videos sharing. You are allowed to share and publish your edited videos on videos sites like YouTube, Facebook and Vimeo directly with iMovie. 1. According to most Apple's products owners, not all varieties of MP4 are supported by iMovie due to its incompatibility, in addition to many other video formats. This issue is no doubt quite annoying as MP4 today is one of the most popular and most used video formats. 2. The storage space is quite limited which leads to difficulty if you have large number of projects. So you will need external hard drive soon. 3. iMovie doesn't perform quite stably. Sometimes, iMovie keeps crashing when editing videos on Mac and iOS devices. Final Cut Pro, as suggested by its name, is a completely new, faster, more intuitive and sophisticated video editing software made for Apple users. When it comes to iMovie vs Final Cut Pro, many mac users will prefer the latter, especially for those who need more professional videos such as video journalists and film editors as it provides access to a wide variety of effects and titling options to allow more creativity in video projects. Like iMovie, Final Cut Pro is only available on Mac. 1. A powerful video editor to edit both simple and complex videos. It can satisfy almost all your needs about editing videos, both home made or professional purpose, in the way you want. 2. This video editing software contains many powerful tools such as the magnetic timeline, background processing, good organization tools—ratings, tagging, auto analysis for faces, scenes, and stabilization etc. 3. Final Cut Pro is able to integrate with Apple's other multimedia editing software included in Final Cut Studio. 1. The film must be saved in a certain type, otherwise the image will mess up. 2. With more professional options available, the interface and operation inevitably become much complicated than iMovie. 3. It's only available for the Apple's OS X operating system and no version is made for mobile platform. To help you make a quick decision, here we list the major difference between iMovie and Final Cut Pro to give you an overview about the two Apple video editing software. You can just choose the right one based on your own needs. Apple Animation codec, Apple Intermediate codec, Apple ProRes, AVC-intra, AVCHD, DV, DVCPRO HD, H.264, HDV, iFrame, Motion JPEG(OpenDML only), MPEG IMX(D-10), REDCODE RAW (R3D), Uncompressed 10-bit 4:2:2, Uncompressed 8-bit 4:2:2, XAVC, XDCAM HD/EX/HD422, QuickTime formats. Final Cut Pro is without doubt a more powerful Apple video editing software. But in fact, iMovie can provide everything one need to edit videos in the way of features and simplification. More importantly, it's much cheaper than Final Cut Pro. That's quite important for many budget-conscious users will choose this video editing software. 1. Final Cut Pro takes a lot more time to fully compose a whole production in comparison to iMovie. iMovie is mainly used to edit footage and still images. 2. iMovie is easier to understand. The much more professional options offered by Final Cut Pro inevitably make it more difficult for the users to use as it may be a bit to complex. For example: Effects -> Video Filters -> Border -> Basic Border. But many people still choose Final Cut Pro in the question iMovie vs Final Cut Pro even if it's times expensive than the former. The reason lies in its strong ability. Some changes it brings are quite kicking and screaming and worth the paying. In a word, Final Cut Pro comes with more formats, more audio and video layers, more dizzying video and audio effects, more in-depth video and audio processing tools, more complicated audio and video transitions, etc. 1. Compare with iMovie, Final Cut Pro offers more editing features. For example, more features it provides and more video formats if supports. 2. More clips is allowed to be added onto your timeline in comparison to iMovie. Only 18 clips are allowed on iMovie while you can have as many as you want on Final Cut Pro. 3. Final Cut Pro is overall a faster and more comprehensive and professional video editing solution. As indicated in the above table, sometimes you will have trouble importing videos to iMovie or Final Cut Pro due to format incompatibility. For example, you will run into trouble if you try to import a video in MTS, MKV, AVI, FLV etc; this is not an issue if you try with proper tools. Here a professional video converter named MacX Video Converter Pro is high recommended. Built in 320+ video and 50+ audio codecs, this video converter is able to convert any video to like MKV, MTS, FLV, AVI etc to MP4, MOV, and M4V that iMOvie and Final Cut Pro accept. One more thing you may be interested is, this video converter also serves as a video editor, which allows you to clip video to get your favorite segment, crop frame size to remove the black bars, merge separate videos into a new one, even add watermark to personalize your videos etc. Besides, if you want to transfer DVD to iMovie or Final Cut Pro for personal editing, you can just rely on MacX DVD Ripper Pro, which can transfer DVDs, including those protected by Disney DRM X-project or the common CSS, Region Code, UOPs, Sony ARccOS and other copy-protection technologies to iMovie and Final Cut Pro with no quality loss. Complete iMovie tutorial to edit, cut, crop, trim, rotate video with iMovie. If you want to make your YouTube video stylish, you can do video editing in advance. Follow the guide to edit video beforehand and then upload to YouTube. Editing videos on Mac can be easier than ever if you got a right video editor for Mac. This article lists 8 best Mac video editing software, helping you cut, trim, crop, rotate videos on macOS like a pro.